I’ve never witnessed it first hand, but I believe New England is absolutely glorious in the Fall. It would certainly be hard to argue otherwise, given the images we here in Scotland see via television movies and the like. Glasgow is some 13 degrees further north than Boston. It sits on roughly the same latitude as Novosibirsk Oblast (Russia) so perhaps I shouldn’t be so surprised by the contrasting perceptions of the year’s third season. But it doesn’t stop me feeling a tad jealous. New England: couples walk romantically hand in hand through the woods. They scatter the dry, brightly coloured leaves as they walk, kicking them into the air for the gentle autumnal breeze to cushion their fall back to earth. West of Scotland: couples walk hand in hand through the woods. 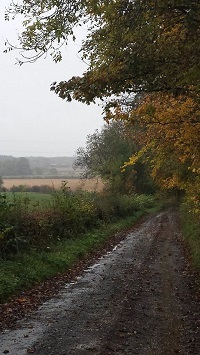 The word ‘romantically’ is omitted, for they are merely providing ballast to prevent the other from slipping on the soggy, rain-soaked leaves. New England: on a bright, sunny day, a happy, smiling middle-aged man contentedly blows the brittle leaves into neat, uniform piles on his manicured, picket fence surrounded lawn. He then effortlessly lifts them into the appropriate refuse bin, which he places on the sidewalk for collection by the local waste collection agency. West of Scotland: on a dreicht, overcast and damp day, a miserable, brow-beaten middle-aged man loses the coin toss / argument / will to live and his wife sends him into the overgrown garden. He accidentally bends the leaf-rake on the second sweep of the heavy, sodden leaves. For the next hour he pushes the leaves into little manageable bundles with his feet, which he then stoops to lift into the appropriate refuse bin. He finally risks a hernia by dragging to the pavement for (eventual) collection by the local council. New England: little mammals take advantage of the new, insulated and warm sanctuary created by the recent fall of leaves. They are pictured in various wildlife journals all cute, curled up and comfortable. West of Scotland: little hedgehogs and other small mammals form an orderly queue at the local housing offices, citing the damp, cold and drab conditions they are expected to live in. They are pictured in various daily newspapers brandishing placards and threatening legal action. New England: having served notices of eviction to the adorable little mammalian tenants, happy and excited families from the street gather round the residual piles on Bonfire Night. A match is placed under the leaves. 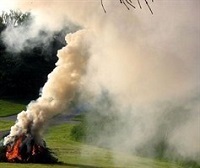 They ignite almost instantly, spreading a cozy glow across the garden that warms the feet of those attending the fireworks display, and now busy toasting marshmallows in the fire’s periphery. West of Scotland: a boxful of spent matches lie strewn on the ground beside the slimy, wet pile of leaves. That brow-beaten, middle-aged man again loses the the coin toss / argument / will to live, and is supervised by his impatient, irksome neighbour as he siphons a litre of petrol from his car into an empty bottle. Having splashed this over the sodden leaves, he flicks the flame of a disposable lighter onto the musty mound. It ignites. Eventually. But there is no immediate, spreading warmth. There is smoke. Lots of smoke. It brings tears to the eyes of those trying to quickly retrieve their still cold potatoes from the base of the supposed fire, before the litre of ‘unleaded’ permeates the skin. The kids from the street have lost interest and are now indoors playing Xbox. The wives are now in the kitchen and on their third bottle of red. One of the husbands has gone home to check on the dog. Another excuses himself on the feeble excuse of having office work he should be doing. The brow-beaten husband waits with the irksome neighbour for the smoking stack to extinguish. There is silence in the garden. A heavy, damp silence. Posted by Cee Tee Jackson on June 12, 2017 in Uncategorized.